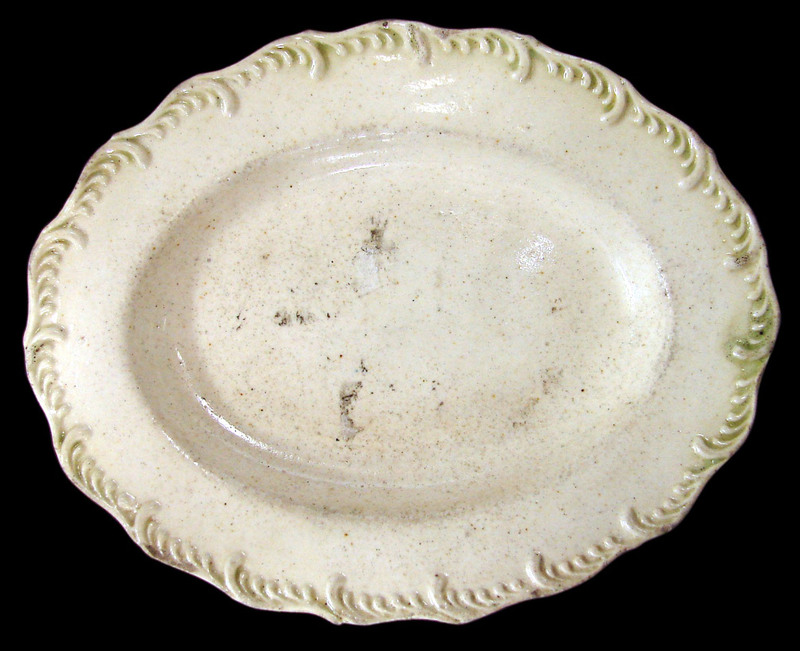 On this page we feature mostly non-military items of the Civil War era and earlier. This was found recently in Pennsylvania, but has the name "Wilbad" carved in the lever and that turns out to be a town in the Black Forest in Germany that is now called Bad Wildbad. "Bad" is German for "bath", a reference to the town's status as a spa town, and of course the Black Forest region is known for its wonderful wood carvings. The old dude is either grandfatherly, a little creepy, or maybe a combination of both! He's about 9" tall overall and about 3-3/4" wide when closed. The details are great, from his facial features to his hands thrust into his pockets, to the fez cap and tassel. Most likely made in H�hr-Grenzhausen and Ransbach-Baumbach area of Westerwaldkreis in Rheinland, Germany. These jugs enjoyed great popularity during the reigns of King George I (1714-1727) and King George II (1727-1760) as George Rex (GR) is Latin for King George. 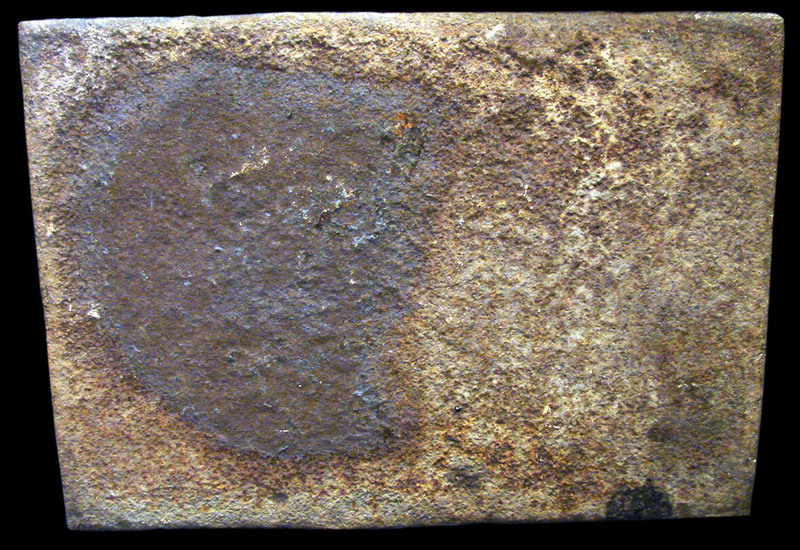 This one dates to George II and was found in the James River in Virginia. Adding to its rarity is its unusually small size, being only 4-7/8" tall! Great condition with nice cobalt blue in and around the various incised and embossed decorations. Nelson was noted for his inspirational leadership, grasp of strategy, and unconventional tactics, which together resulted in a number of decisive British naval victories, particularly during the Napoleonic Wars. He was wounded several times in combat, losing the sight in one eye in Corsica and most of one arm in the unsuccessful attempt to conquer Santa Cruz de Tenerife. He was shot and killed during his final victory at the Battle of Trafalgar near the port city of C�diz in 1805. 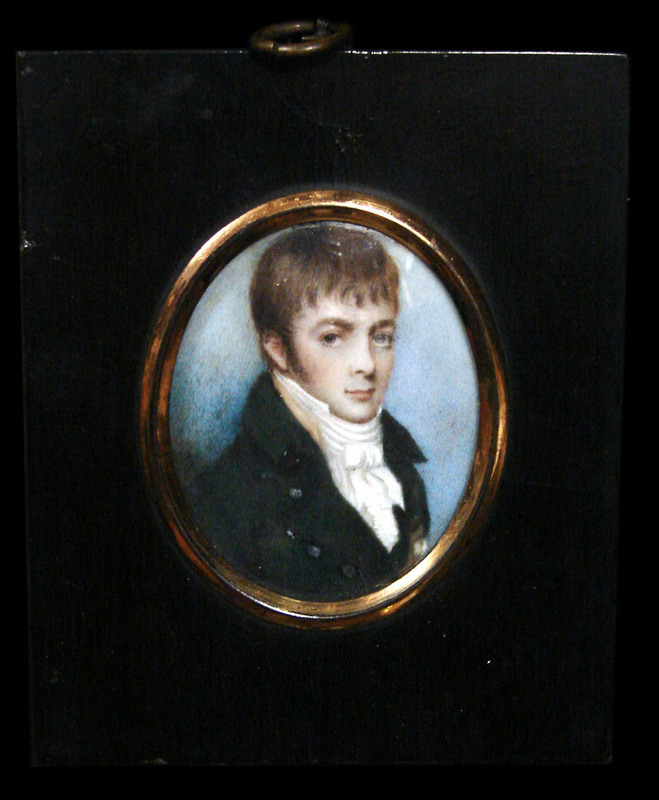 The beautiful frame is about 5-1/2" x 4-1/2" and the painting is about 5-1/2" x 4-1/2"and is protected by a slightly convex cover glass. with embossed eagles and anchors and only very minor signs of wear! This hand made "sewing bird" has a mahogany body with bone implements for holding thread and a pin cushion, and two mother of pearl plaques, one of which bears the inscription "For Nellie" and the other says "Think of me". There are also two photos attached... one young man (presumably the maker) and one young lady (presumably Nellie!). About 7-1/2" tall x 5-1/2" wide. This piece has super eye appeal! 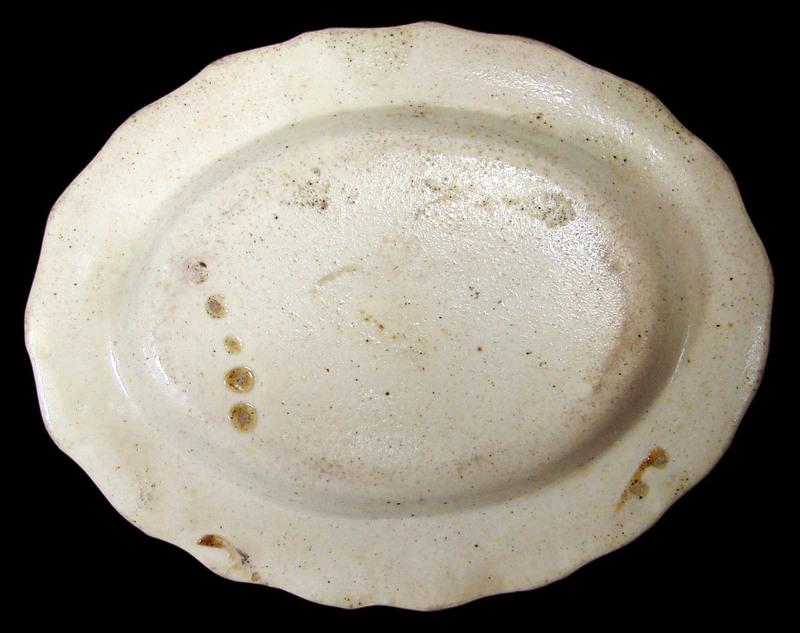 This is a tiny little platter, about 5-1/2" x 4-1/4"and this is a case where small is good! A little bit of green decoration on the edge detail too! fireplace with a secondary function is as a radiator of stored heat. with a rat tail bowl and has a Monarch's Head on the handle and cool designs on the back of the bowl. About 9" tall and 9" in diameter bronze bell with elaborate detail cast throughout the body. Details include a cross, a Madonna type figure and lots of floral type motifs. it still works very well! Beautiful, cobalt blue decanter, about 11" tall with a ground pontil. Nicely decorated with gold and white floral and bead swags. No chips, cracks or damage. 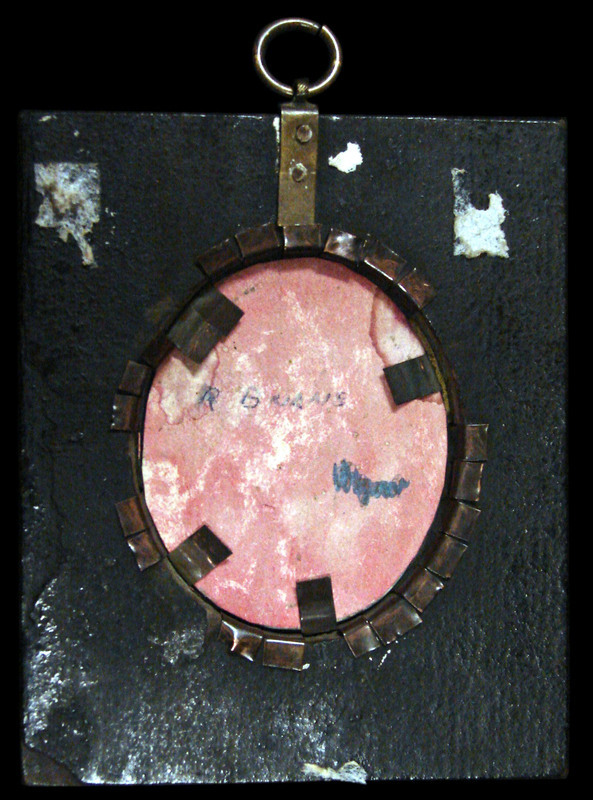 and is mounted in a wood panel that measures about 3-3/4" wide x 4-1/2" tall, not counting the brass loop hanger. It is marked R Brian" on the back in ink. 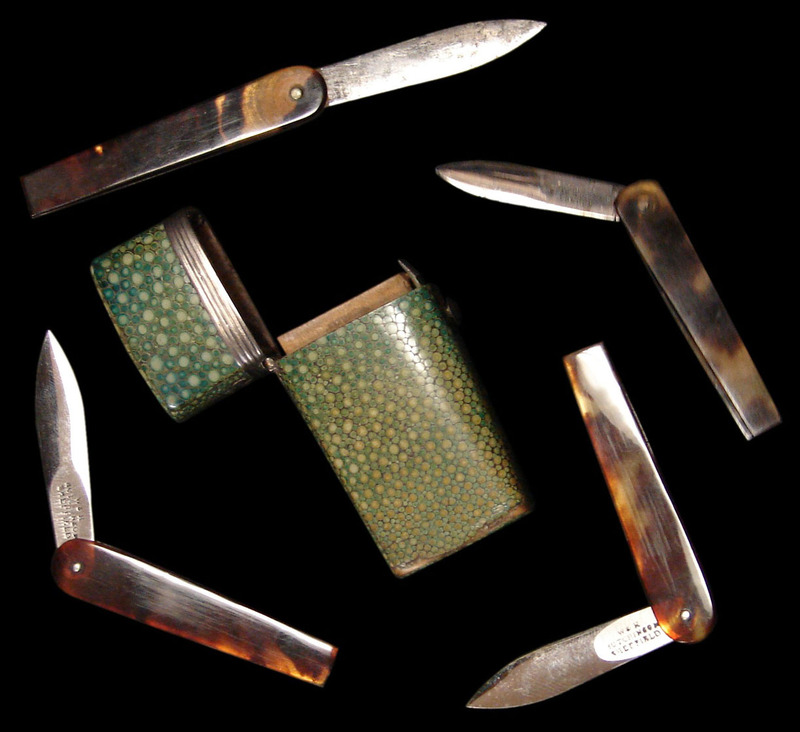 19TH CENTURY CASED SET OF THUMB LANCETS, OR FLEAMS, Dated 1837 and ID'd to "J. D. Ward"
Small (about 2-1/2" tall) flip-top container made of paper mache' with a cool built up hard painted surface. 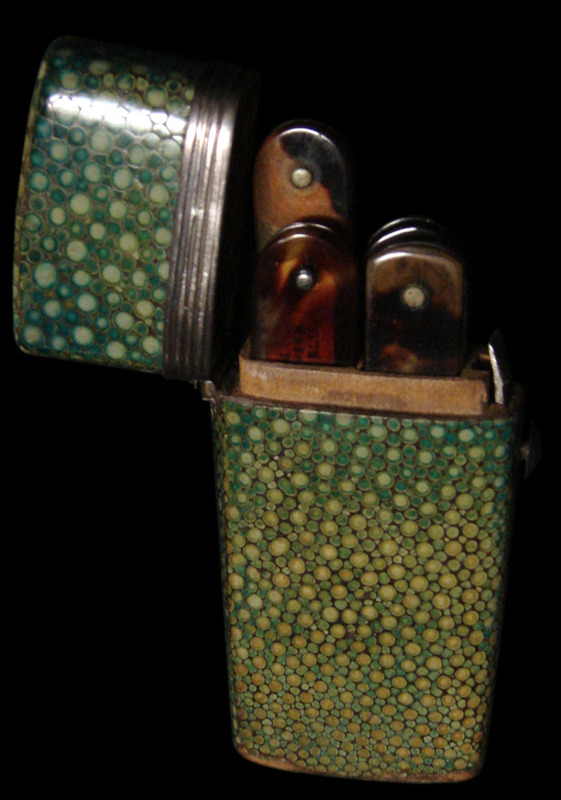 The interior is divided to hold four folding lancets (knives) with tortise shell handles that when unfolded are about 2-1/2" long. While many of the larger fleams that we see were sometimes used for veterinary work, the "thumb lancet" as seen here was definitely intended for the purpose of medical bloodletting on humans! This was done when your doctor determined that your illness resulted from an imbalance of the fluids in your body, and the remedy was to reduce the amount of your blood! 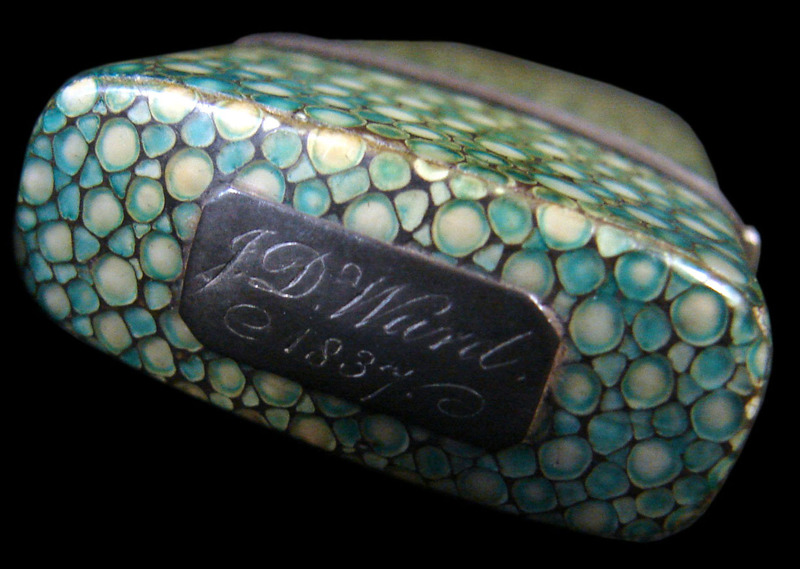 Lancets like these were also used by some doctors for vaccinations. 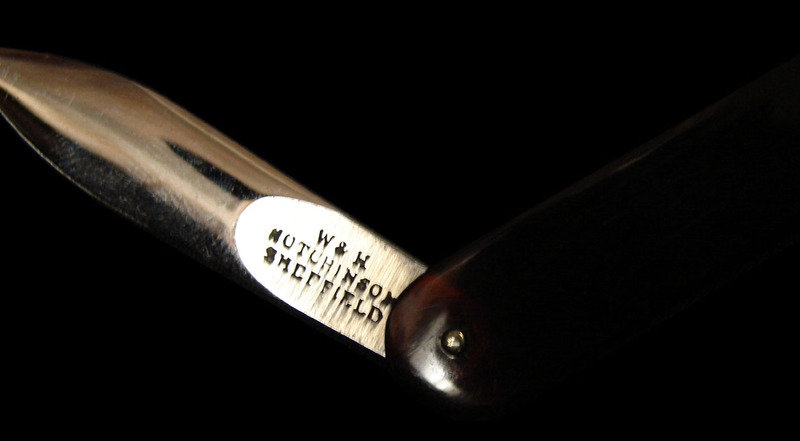 The blades here are marked "W&H / Hutchinson / Sheffield" who was a Surgical Instrument Maker to the Royal Navy based in Sheffield, England, and also sold surgical instruments to the Union and Confederate Armies during the US Civil War. 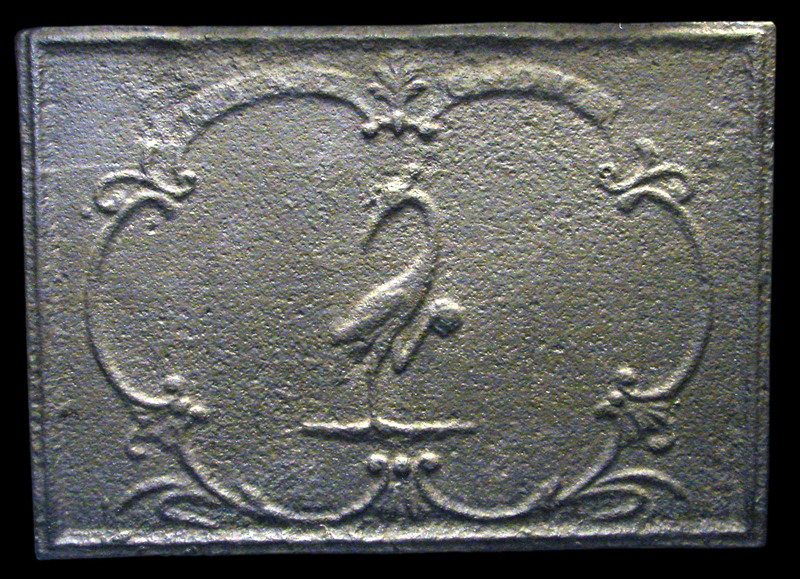 A silver plaque on the top is engraved with the owners name: "J.D. 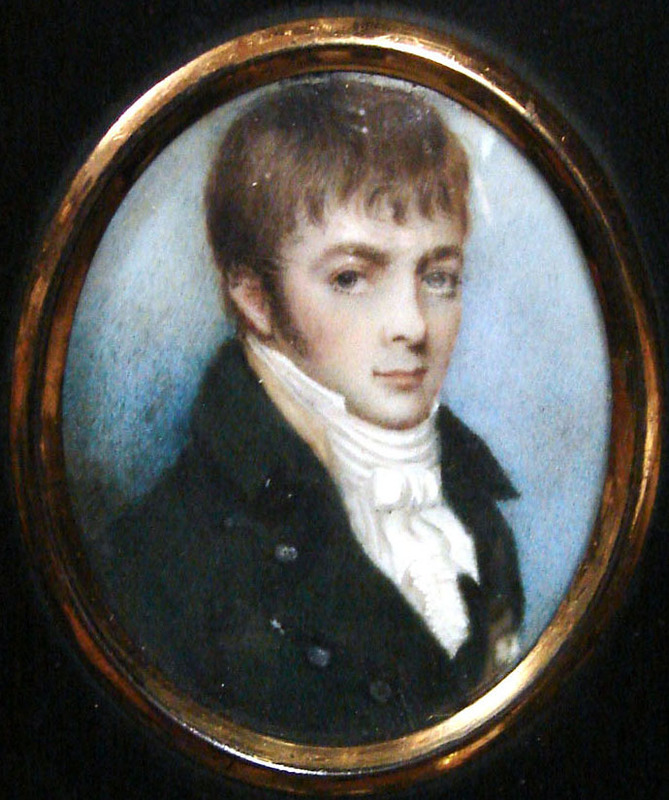 Ward" and dated "1837". This is a cool medical artifact in pretty much mint condition! Dr. Rene Laennec invented this type of stethoscope in 1816 and it was the state of the art until the invention of the binaural stethoscope (the two earpiece type that we still use today) in 1852. 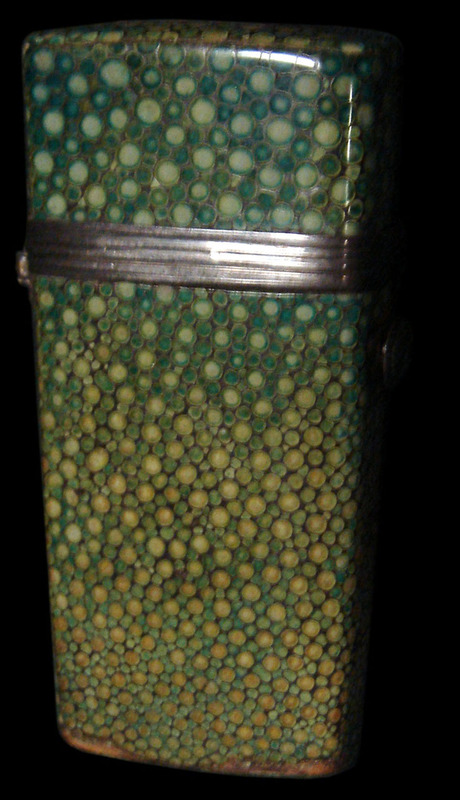 This one is about 7" long with a 2-1/2" ear piece and a 1" chest bell. The wood is beautiful (it is a bit darker in person than it appears in the photo) and has no cracks or chips. A nice addition to any medical display! 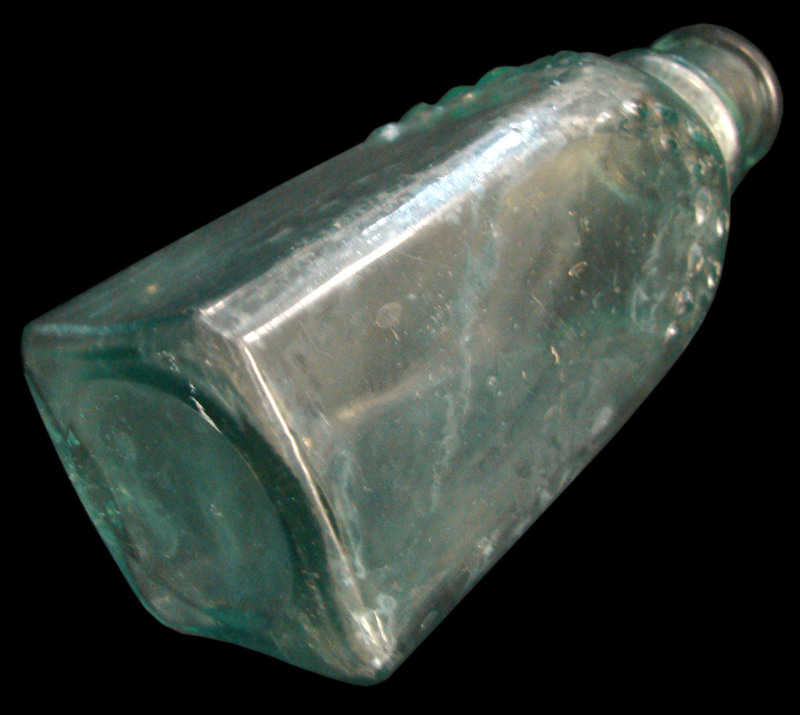 7-1/4" tall four sided cathedral pickle bottle in a nice aqua/green color with a partial label. 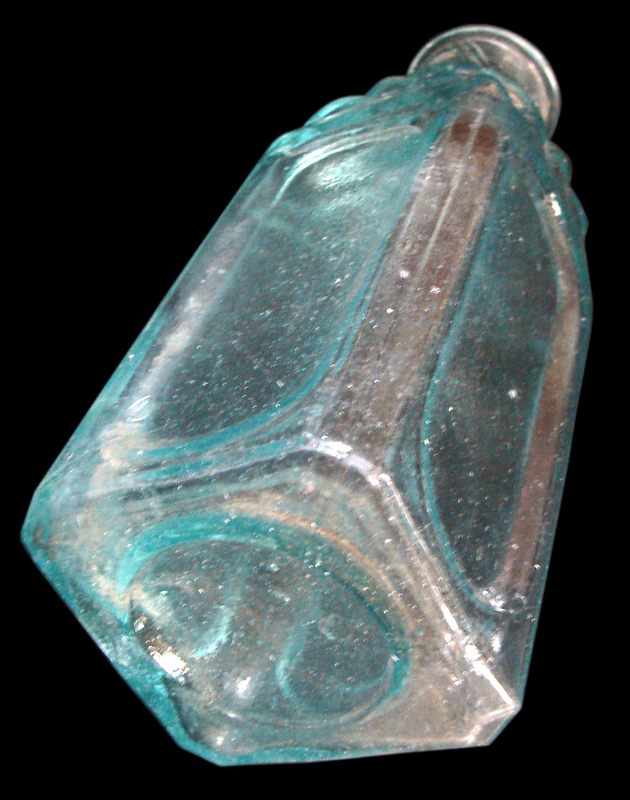 7-3/4" tall four sided cathedral pickle bottle in a beautiful aqua/green color, embossed "SJG" . 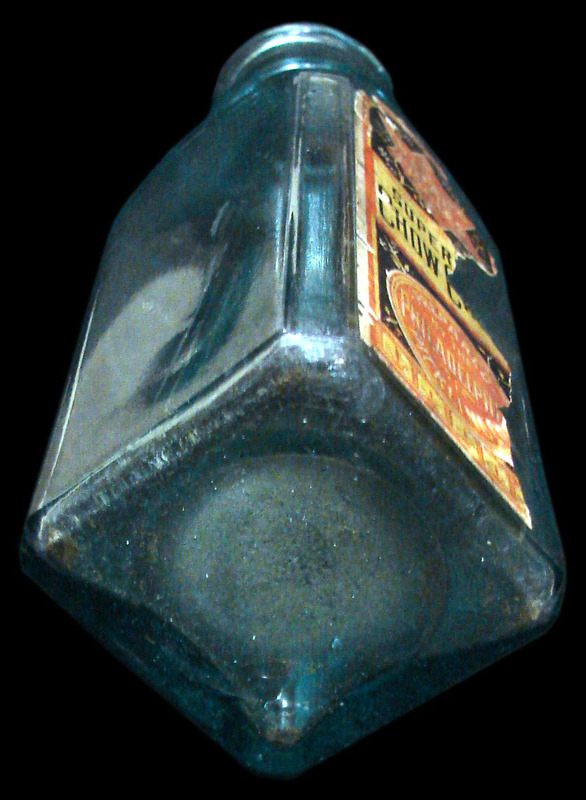 9-1/2" tall six sided pepper sauce bottle in a nice aqua color. nice aqua color with no damage! About 7-1/2" tall, seamed , cast brass candlestick, circa 1770. Has a solder repair near the base that could be cleaned to look better, but doesn't look bad as is. Very attractive addition to any display of early artifacts! "Maria Horner" with flowers in a vase and dated 1852. Nice colors, probably Pennsylvania. Approximately 4-1/4" x 7".